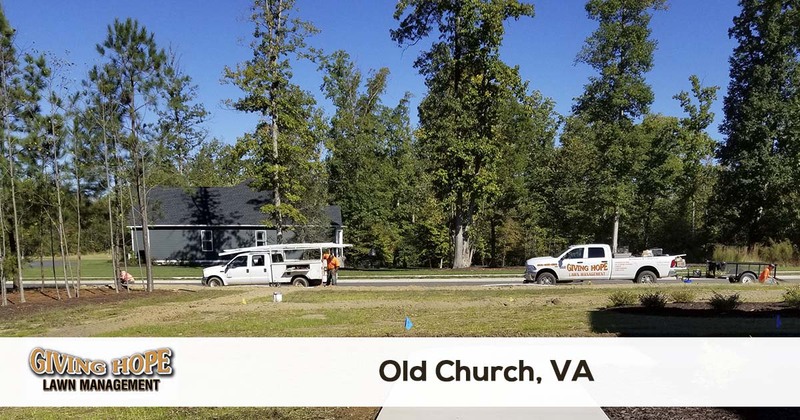 Giving Hope Lawn Management is proud to serve the community of Old Church with professional lawn care and landscaping services. For more information or to get a free quote call us today at 804-839-8340. What’s interesting about the town of Old Church, VA, is it became a community following a Civil War battle. And while it may not have made its way into textbooks, it’s still a quaint town much love calling home. But just because it’s a great place to raise a family doesn’t mean it’s simple to find the services you need. In fact, hiring dependable options for Old Church lawn care is a struggle! When you need quality landscaping you can afford, you need to call Giving Hope Lawn Management. Since 2011, we’ve remained the top choice in local yard care services! From monthly lawn mowing and weed control to troubleshooting your irrigation systems, we have the level of expertise you can trust every day. Call us now for your best landscaping services and save more on every visit! We understand the hassle you go through in maintaining your yards. Whether your home stays covered in weeds or your commercial property is a mess, keeping your curb appeal up is a lot of work! Instead, you can save a ton of time and money by hiring your local landscaping experts. From new construction grading to regular yard maintenance services, our team does it all for less. Why should you continue spending a fortune on yard care that doesn’t get results? Instead, you need the company that keeps more lawns green! When other landscaping services fail to deliver, you need the team that always provides your best yards. Call us today to begin enjoying your best outdoor areas! Giving Hope Lawn Management is the industry leader for lawn care and landscaping in Old Church. We offer a 100% satisfaction guarantee with all of our services, so there is no risk for you to give us a try. Give us a call today for the fastest service at 804-839-8340.